Have New York City at your doorstep when you stay at Courtyard New York Manhattan/SoHo. Although New York City is The City That Never Sleeps, you'll get a restful night in our spacious guest rooms appointed with luxurious bedding and first-rate amenities. Stay productive with free Wi-Fi and an ergonomic workspace, or kick back and relax while enjoying your favorite show on a flat-panel TV. Wake up and start your day satisfied with a delicious breakfast from Table 181, featuring a selection of specialty Starbucks beverages to jump start your morning. While in The Big Apple, work up a sweat in our fitness center equipped with cardio machines, then unwind with a cocktail from our on-site bar. When it's time to have fun off site, explore nearby neighborhoods including Manhattan, Greenwich Village, Little Italy and Chinatown just minutes from our hotel, and check out premier attractions such as the Statue of Liberty and Washington Square Park. 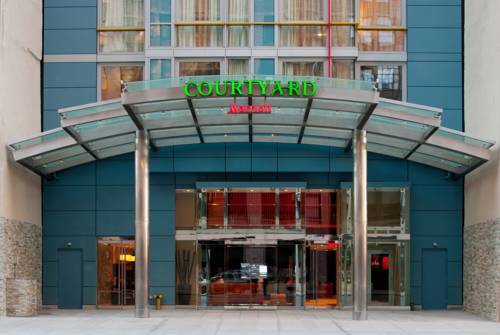 Book your upcoming stay at Courtyard New York Manhattan/SoHo today! Our SoHo, NY Hotel is your food and beverage destination for refreshing breakfast choices. The Table 181 SoHo Cafe also offers specialty beverages made with Starbucks coffee to help you get a jump on the day.